Whisk the unchilled QimiQ Classic smooth. Add the water, sugar and yeast and mix well. Allow to rest for approx. 5 minutes. Add the flour, molasses and salt and knead to a smooth dough. Place the dough into an oiled vessel. Cover and allow to rest in a warm place for approx. 30 minutes. Divide the dough into strips and shape into pretzels. Preheat an oven to 450 °F. Mix the baking soda with 4 cups of water and bring to a boil. Brush the pretzels with the mixture and place onto a greased baking tray. Brush the pretzels with the egg yolk and sprinkle with the salt. Bake in the preheated oven until golden brown and allow to rest for approx. 5 minutes. 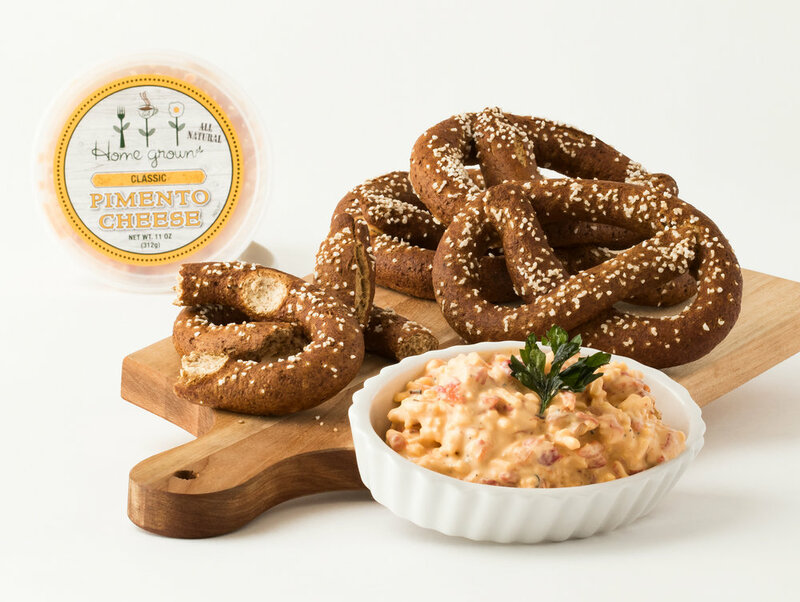 Serve the pumpernickel pretzels with the Home Grown pimiento cheese.